The bases of the SEB Security System are computer networks. 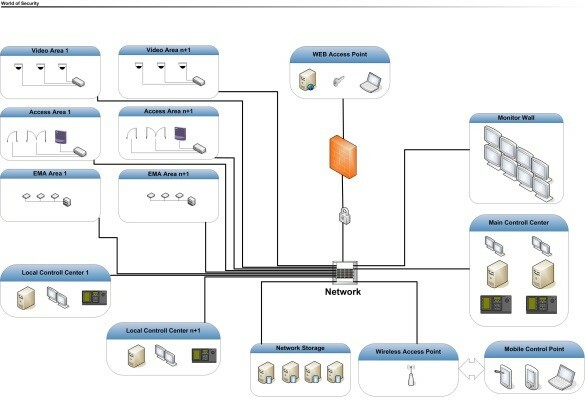 All important parts are direct connected via TCP/IP. The physical network, which should be a structured network with GBit FO or Cat7 LAN backbone, can be shared with company network or for high security purpose virtual or physical separated from other existing networks on the site and therefore used only for security needs. Every communication on the network can be encrypted. WAN structures, with public or private segments can be used for building up distributed networks. The system time of every security component is synchronized to the same time base. Each System will be defined together with customer according to the way of analysis of “Common Criteria (CC)”after a security analysis which analysed the risk was done. (Safety analysis with threat scenario). The security analysis will describe and define all processes, parts of systems, organizations which are security relevant like Enrolment Process, interface to personalization system, Skill of Operations, Reporting systems, Methods for continuous check for abuse, Secure interfaces to 3rd party devices, and others. Our solution is an integrated system which ensures that the security persons have all information and tools, which they need, to make sure that they can handle every event for security reasons. The System itself is designed as an online System with the possibility to run offline as well in case of a network breakdown. Redundancy is implemented as 3 level fall back system. The high security system will collect all data. This is done also during offline mode and protocol data is transfer into the database after the connection is shifted to online again. It is a fully-compliant HSPD-12 system with a unique, controlled and completely secure ID in the form of a PIV card.